– for some rude humor and mild comic action. DreamWorks Animation made a name for themselves with the 2001 blockbuster sleeper Shrek, following it with the even more successful sequel to the film three years later. Since then, the studio has released the mediocre Shark-Tale and clever and memorable Madagascar, solidifying themselves as a worthwhile provider of animated entertainment in Hollywood. With the release of Over The Hedge, the studio has on their hands a winner that nearly rivals the gold Pixar usually brings to the silver screen. Gorgeously animated with vibrant colors, characters, and voice talent, Over The Hedge is a smartly written, wonderfully executed computer animated film. While the premise is somewhat familiar (an outsider uses a group of naive and unsuspecting characters for their own personal motives), the film uses a unique, original setting and situation to really give Over The Hedge its own identity and charm. From start to finish, the film is as adorable as imaginably possible and frequently funny. Relying mostly on original comedy instead of pop culture jokes, Over The Hedge takes plenty of jabs at upper class yuppie living and mankind’s gluttony leanings instead. Most importantly, however, is the film’s emphasis on family and honesty that feels natural; never feeling forced or heavy-handed. The voice casting is perfect. While raccoon ringleader RJ was originally set to be voiced Jim Carrey, replacement Bruce Willis seemed to be a more appropriate fit. Comedian Garry Shandling was a surprisingly inspired choice for the more reserved character of Verne. The spastic squirrel Hammy is brilliantly voiced by the hyperactive Steve Carrell, who delivers some of the film’s funniest lines and moments (his contribution to the film’s finale is genius). Everyone else is really just as good — from William Shatner’s Ozzie the possum to Wanda Syke’s spunky skunk Stella. Over The Hedge is fast-paced without ever sacrificing the story for cheap thrills. And the filmmakers take just as much care in rounding out these lovable woodland creatures as they do in brilliantly animating them. There’s hardly a problem visible in this little film. For the youngsters, a few scenes may be a little too dark or even scary for them. A grizzly bear named Vincent is menacingly portrayed by the gravelly voiced Nick Nolte, with his scenes posing as a threat to RJ and the gang. And althought often silly, Dwayne (the “Verminator”) and Gladys (the vicious yuppie intent on ridding her perfect suburbia of the furry pests) are also out to get our little food-thieving heroes. None of it is excessive, but it is enough to earn its PG-rating. And while DreamWorks has let some mild profanity slip into their films in the past, the filmmakers keep Over The Hedge pretty clean, only utilizing the common ‘substitute’ swear words like “heck,” “jeepers,” “gosh,” and “dang” instead. The only complaint I could find, however, is the inclusion of Ben Fold’s original songs written especially for Over The Hedge. His songwriting style seemed out of place for such a movie, especially an animated film like this. Perhaps whoever chose Folds thought it might have been a good idea in theory, but the mediocre songs just felt glaringly misplaced. On the other hand, if that’s the only thing I can find wrong with this animated flick, then that ain’t too bad. 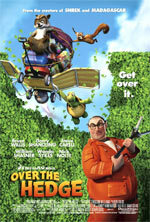 Over The Hedge is a truly delightful little animated film that I found to be better than I expected. Loaded with plenty of laughs, beautiful visuals, and a lot of heart, the latest from DreamWorks Animation offers a solid positive pro-family message that isn’t muddled by any kind of agenda, giving the film a sense of genuineness that similar films as of late have been lacking.